Sheikh Mohammed bin Rashid Al Maktoum chose Calatrava’s design, which should be complete in 2020 – just in time for the World Expo 2020. Abu Dhabi Media publication The National likened The Tower at Dubai Creek Harbor to the Eiffel Tower, built for Paris’ 1889 World Fair. Calatrava cited Islamic tradition as inspiration for the colossal tower, which will be nearly 100 meters (just over 328 feet) higher than the Burj Khalifa. 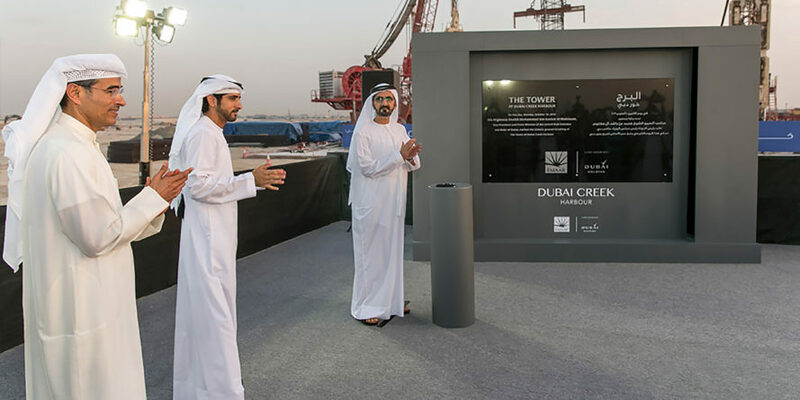 The Tower at Dubai Creek Harbor will be a key component of Emaar Properties’ Dubai Creek Harbor development, which will be double the size of Dubai’s current downtown area. Emaar Properties describes The Tower at Dubai Creek Harbor as a “next-generation smart hub” packed with cutting-edge technology. According to the company, the tower will “incorporate an advanced digital lifestyle defined by the latest developments in artificial intelligence.” They have already finished wind-engineering and seismic tests to ensure the safety of the soon-to-be tallest tower in the world. Will that giant thing have a proper sewage system? Or will trucks move the poop around? Dubai ruler Sheikh Mohammed bin Rashid broke ground on what will be the tallest tower in the world. Emaar Properties is developing The Tower at Dubai Creek Harbor. Santiago Calatrava designed The Tower at Dubai Creek Harbor.